Looking for a night of great Irish music, Irish food and fellowship for St. Paddy’s Day this year? The Lafontaine Arts Council and The 1014 Club certainly hope that’s the case. They are partnering to sponsor a great St. Paddy’s Celebration at the Knights of Columbus on St. Patrick’s Day on Friday, March 17. Doors open at the Knights of Columbus, located at 2817 Theater Avenue in Huntington, at 5:00 p.m. Dinner is served from 5:30 – 8:30. A selection of Irish food items will be available for purchase and a cash bar as well. The Irish band Soltre’ will play from 6 to 8 pm. 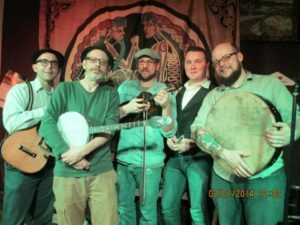 They are a group of talented multi-instrumentalists and singers that have a common love for folk music in the Irish and American traditions. These lads will have your hands clapping and your feet tapping to the beat of the Irish tunes. Band members include: Sean Ellswort-Hoffman: Vocals, Fiddle, Guitar; Rick Willey: Vocals, Mandolin, Fiddle; Eric Fiechtner: Vocals, Bodhran, Fiddle; Adam Carter: Vocals, Guitar, Banjo Additional information about the evening can also be found on the LaFontaine Arts Council Facebook page. Further questions can be directed to LAC Executive Director Debbie Dyer at 260-358-0055. The Irish Band Soltre’ will provide Irish music for the St. Paddy’s Day Event at the Knights of Columbus on Friday, March 17.Caption for attached picture: The Irish Band Soltre’ will provide Irish music for the St. Paddy’s Day Event at the Knights of Columbus on Friday, March 17.